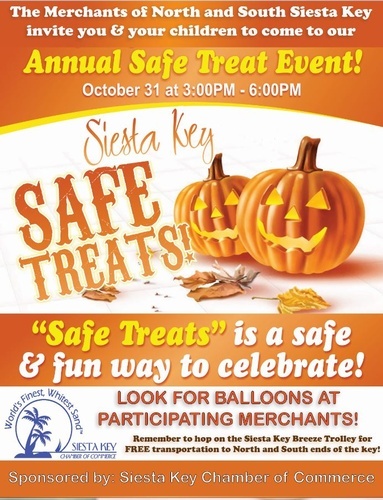 Siesta Key, FL: For the 34th year, Siesta Key will once again host “Safe Treats” on Wednesday, October 31, 2018 from 3 PM to 6 PM. In addition to Siesta Key Village (North), the event has expanded to include merchants on South Siesta Key. Bring your little ones to trick or treat and look for participating members displaying festive balloons. Hop on the free, Siesta Breeze Trolley which makes a continuous loop between the Village and Turtle Beach, with multiple stops along the way. This free event provides a safe venue for children on Halloween and is fun for the whole family. Come to the Chamber and participating businesses (North and South Siesta Key) marker by festive balloons that will hand out treats to children in costume.